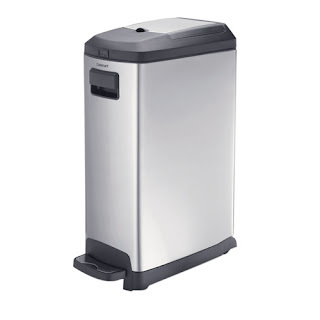 This Cuisinart 9 Gallon Slim Fit Step Trash Can has a fingerprint proof, stainless steel finish with black plastic accents. The slim, unique shape of the can is perfect for small spaces, yet tall enough to provide ample capacity. The can features a quiet close lid, strong pedal system, and over sized pedal. The can's liner handles, 'easy lift' liner vents, soft grip bag pinch, and a bag storage compartment make bag changes a snap, while wheels and handles in front allow for easy moving of the can. Lid lock and odor block features help keep the waste contained. 27-3/4 inches high, 9 gallon capacity.